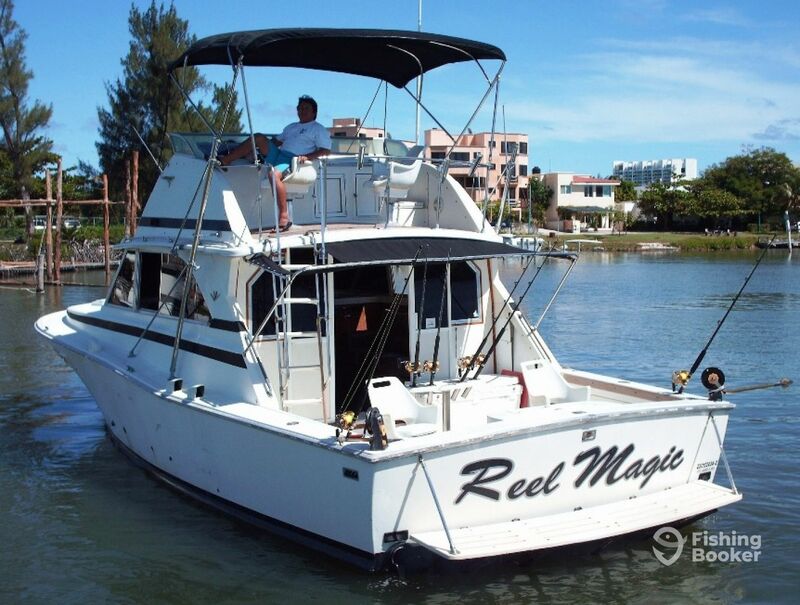 Reel Magic is a 38’ Bertram powered by twin 430 HP Cummins diesel engines. The vessel is equipped with a GPS and Fishfinder, as well as a UHF-VHF radio and stereo. On board, you’ll find an air-conditioned cabin with a bathroom, a bedroom as well as a fly bridge. 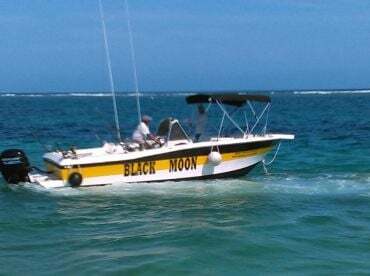 There are 2 fishing chairs and 6 fishing rods utilized (mainly Shimano and Penn) along with Penn International and Senator reels, as well as the standard combination of downriggers and outriggers. 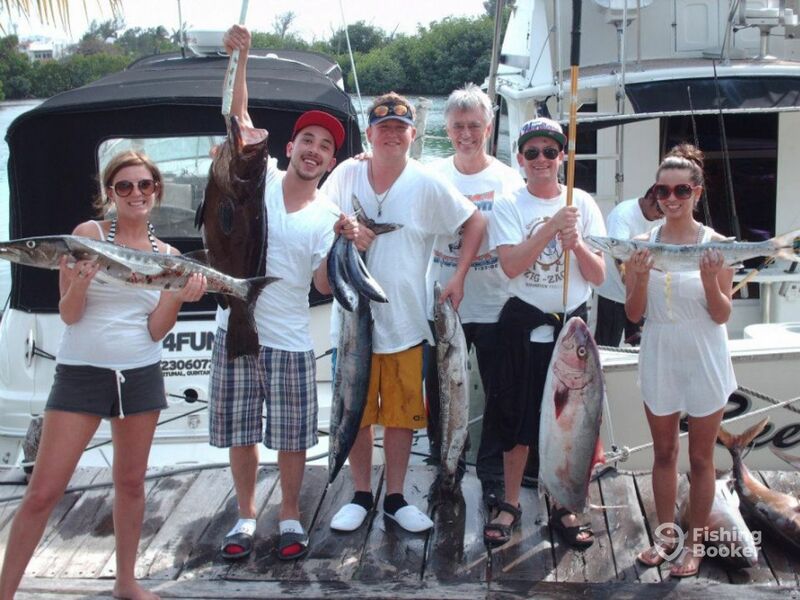 Established in 1996, Fishing Charters Cancun is a pioneer sportfishing service covering the Cancun area. The entire team is fluent in both Spanish and English, and have more than 60 years of fishing know-how in the region combined. They are here to cater to all your requests. These waters account for some of the shortest runs to the fishing hotspots lurking beyond the Continental Shelf. 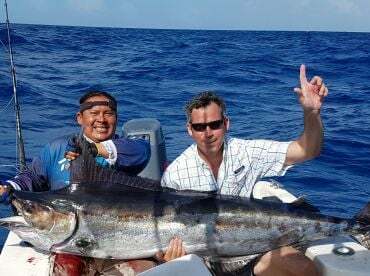 The offshore grounds are productive virtually all year round, inhabited by a large variety of prized game fish, such as Tuna, Dorado, Marlin, Wahoo, and several other species, depending on the season. 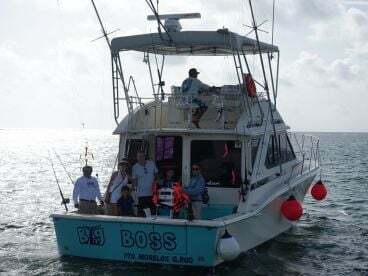 Fishing Charters Cancun enjoy taking everyone fishing, regardless of whether they’re looking for a tournament-style fishing or have yet to hold a rod for the first time. 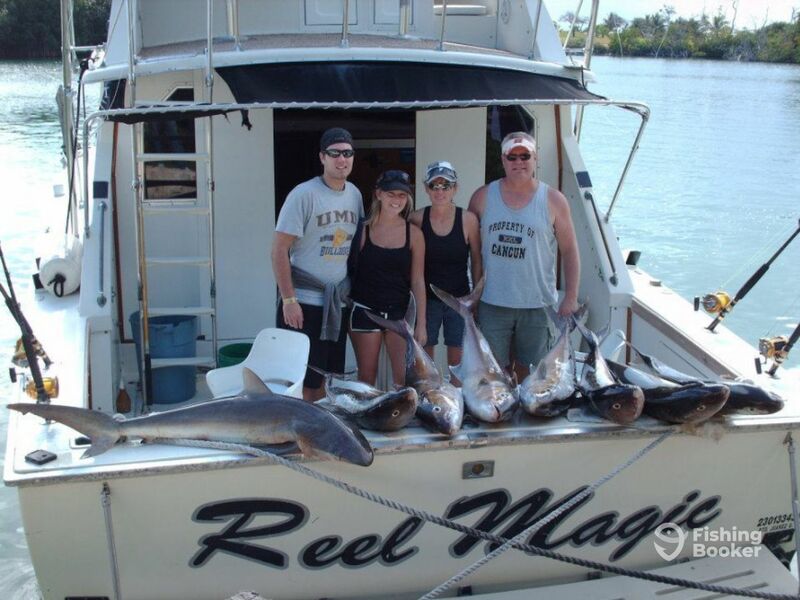 From amateur anglers to professionals, from singles to couples, families to companies, they are always happy to be able to take you out fishing. Soft drinks (water and beer) and a cooler with ice are included on all fishing trips. Please note that there is an additional $10 per-person dock fee. A Full Day trip will give you the best chance to go after every big game species in season. 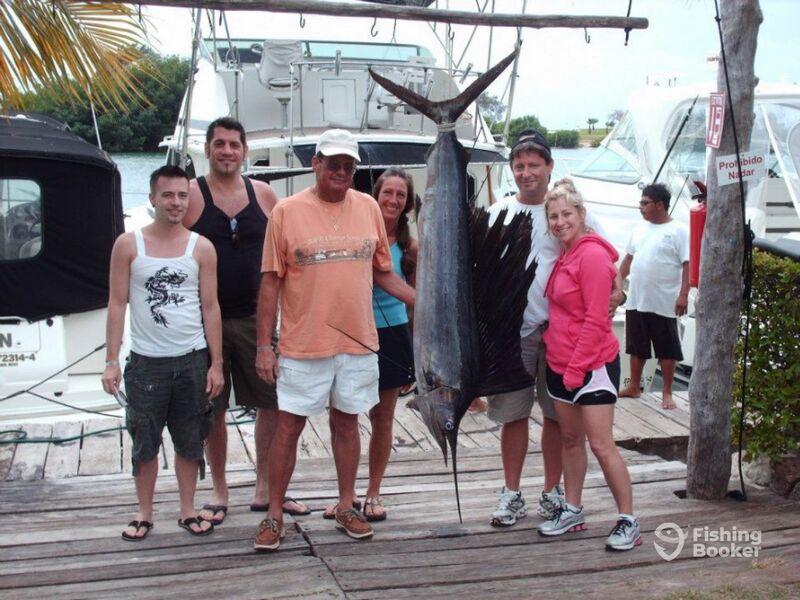 If you'd like to target Sailfish and Marlin, you'll be able to troll with a higher chance of success, or if you would simply like to catch as many fish as you can, the crew can take you trolling and bottom fishing. 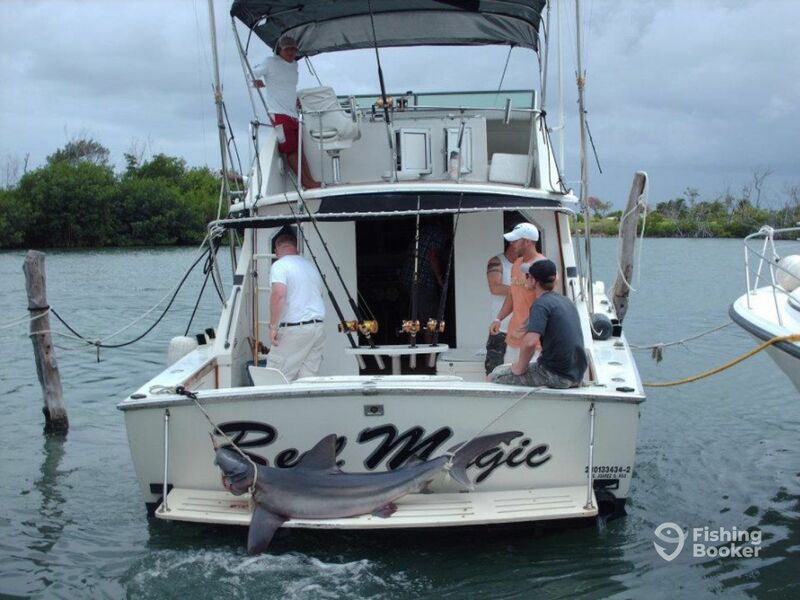 Either way, the Reel Magic team will have more time and more freedom to relocate from one area to another, in search of the best fishing spot for you. On a 3/4 Day trip, you get more chance to catch more fish. 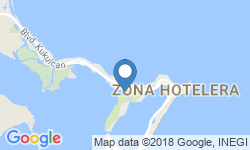 For only $100 more compared to a 4-hour trip, you double your chances of catching fish, since instead of fishing for only about 2h, you will be there for 4h instead. You can now go after Billfish (Marlin and Sailfish), Wahoo and Dorado, dependent on the season, of course. 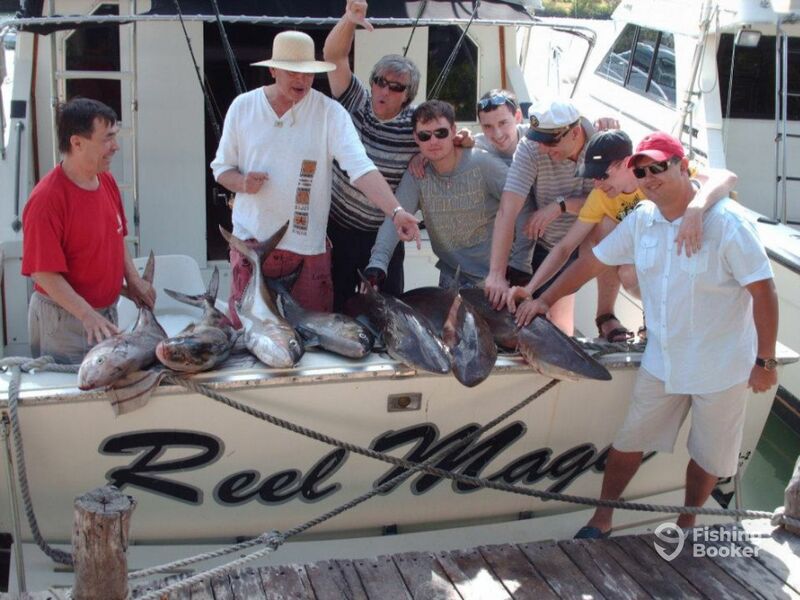 Other common targets include Tuna and Barracuda, Red Snapper, Grouper, Triggerfish and Amberjack as well. 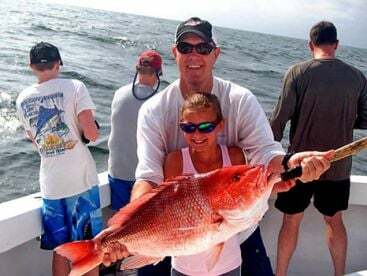 It usually takes an hour to reach the fishing grounds, and it takes more or less the same to get back to the shore, which is why this is the minimum time recommended for Deep Sea fishing. 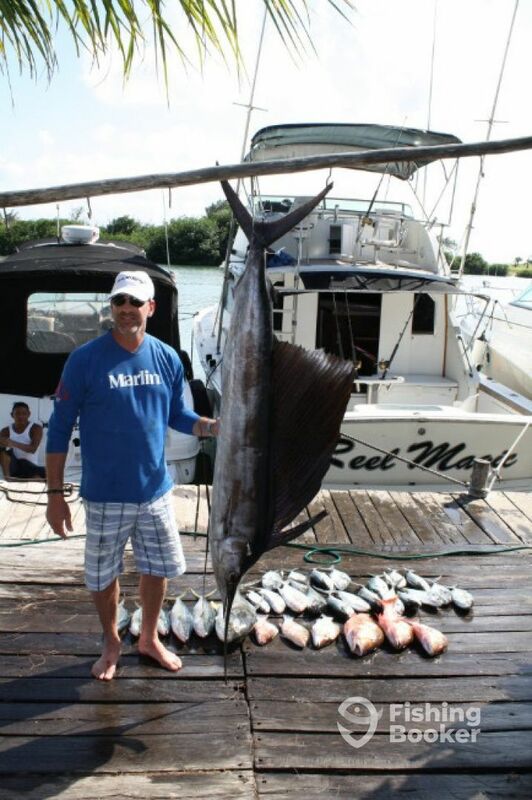 You'll still get to fish for a variety of species, including Mahi Mahi, Mackerel, Tuna, Wahoo, Barracuda, Bonitos, Snapper variety, Grouper, Triggerfish and Amberjacks, but there won't be enough time to go after Sailfish or Marlin. Bertram () originally built in 1970. Powered by 2 430HP Bertram engines, with a maximum cruising speed of 13 knots.